Most bottles of wine are drunk, but over a lifetime, a handful are experienced. This has nothing to do with cost, even if a hefty price tag is the corollary. Call it utopia, call it nirvana, call it whatever you want, but sometimes a bottle of fermented grape juice transports you to a higher plane. It becomes immediately and indelibly imprinted on your mind, mounted upon the mantelpiece of life’s precious moments, alongside your first kiss. It triggers a sensory, intellectual, even quasi-religious reaction whose ripples are felt for days, months and years afterward. The elevation from a mortal wine to an experience is enhanced by historical significance, transmuted into a memento of a bygone era that, uniquely, can be consumed. It is a glass vessel that holds the untold stories of men and women who contributed to its existence, and you write the final chapter. 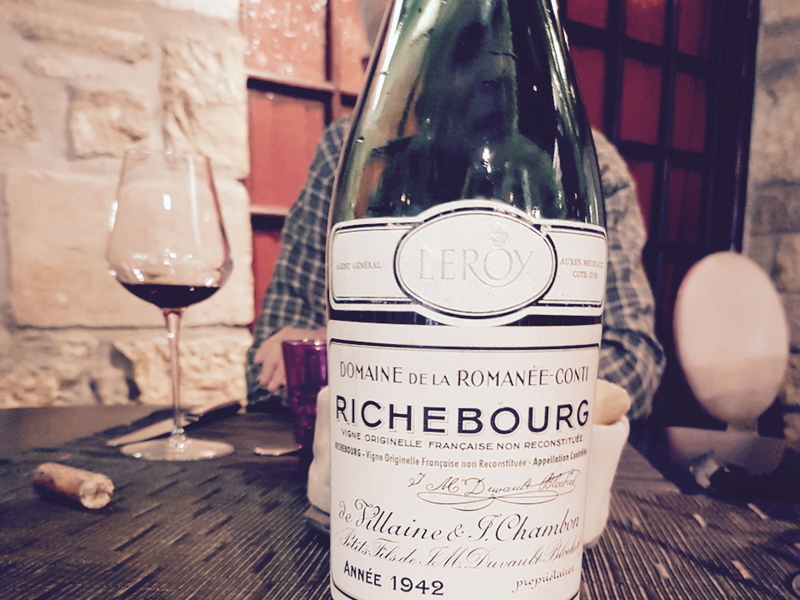 Such an experience transpired in Burgundy a few months back, courtesy of an incredibly special bottle: a 1942 Richebourg from Domaine de la Romanée-Conti. What distinguished this bottle were the words printed underneath that unmistakable font pronouncing the vineyard: “Vigne Originelle Française Non Reconstitutée.” This is a Holy Grail for Burgundy lovers, or at least for those who are aware of its existence. It is a fabled wine that I presumed I would never see, let alone drink with Aubert and Bertrand de Villaine. It is habitually referred to as “Richebourg Vieilles Vignes,” but I have not used that name here because there is no mention of those words on the label, and moreover, vine age is not this wine’s raison d’être. Allow me to explain. From the time the phylloxera louse was detected in 1879 until the cessation of World War II, the domaine’s vineyards were re-grafted plot by plot onto American rootstock. However, the proprietors left a few rows of Romanée-Conti and Richebourg to chance their luck year by year on their original Gallic roots, and established separate bottlings from their grapes. With respect to Richebourg, Allen Meadows proposes that this comprised a 1.2-hectare plot, probably planted in the late 19th century, though Aubert de Villaine himself avers that it constituted just a few rows and a couple of barrels. It is impossible to discover exactly when this cuvée was initiated, but in all likelihood, it began in the mid-1920s and continued until the valedictory 1945. Bollinger’s Vieilles Vignes Françaises excepted, to my knowledge the holding in Richebourg represents the country’s last vestige of productive red vines on French rootstock since the vines were pulled up in 1946, a year later than Romanée-Conti. It should be noted that back in those days, the aim was not to extort more money from consumers willing to pay a premium for a special cuvée. Remember that Burgundy languished throughout the 1930s, perceived as far less noble than Bordeaux—not to mention that in 1942, oenophiles were probably more preoccupied with surviving until the next day than with something as trifling as wine. I suspect that the Vigne Originelle Française Non Reconstitutée was made in order to observe the difference between the two cuvées, to postpone the anguish of uprooting long-serving vines and, of course, to inspire a bit of patriotism that was much needed during the country’s occupation. Nineteen forty-two was a significant year for the domaine, as it became a holding company, a société civile, upon Henri Leroy’s acquisition of 50% of the shares from Jacques Chambron. Aubert de Villaine, who was an infant at that time, told me that the family fled to unoccupied France as the German forces advanced, fearing the ensuing violence. Eventually one of the village’s evacuees volunteered to return to Vosne and scout out the occupied village, finding that the German army was simply billeted in houses. Families returned to pursue their livelihoods as best they could, and life went on. With respect to Domaine de la Romanée-Conti, the Clin family oversaw daily operations, led by Louis Clin, a former army officer hired by Gaudin de Villaine in 1911. According to writer Richard Olnay, “Clin had been recommended on the grounds of managerial experience and exceptional probity, but he had no experience with wine.” Nevertheless, Clin’s perfectionist ideals ensured that he was soon overseeing legendary wines. He also had the savvy to hire the 16-year-old André Noblet (father of recently retired Bernard Noblet) as cellar master in 1940, and sent regular reports detailing the progress of the growing season to Henri Leroy. Fast-forward a few decades. The 1942 Richebourg is placed on the table by the munificent Jordi Oriols-Gil, who chanced upon not one but three bottles. Our rendezvous is a restaurant off the beaten track that serves simple but sound Burgundy cuisine. 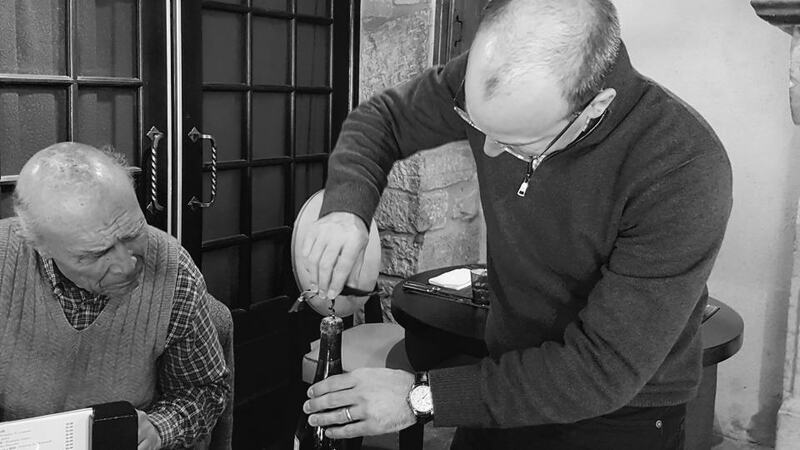 The head sommelier is given the onerous task of delicately easing out the cork. At the back of everyone’s mind, we pray that it is not fake or corked or oxidized nor has had any contact with a man named Rudy. My gut feeling? This is the real deal. The cork is intact and appears young, the branding indicating that it was re-corked at the domaine in 1986, which tallies with Aubert’s recollection. After the first pour, it is easy to see the blue tint to the glass, common during wartime since glass was difficult to source and you used whatever was at hand. We nose the wine. Initially, it just smells old. Fresh and clean, but it does not hide its age. Aubert smiles. He is clearly moved by this bottle and becomes solemn and pensive. After a minute or two, he colors in the background, speaking about the unsung heroes, the Clin family, and how they kept the domaine running during the war. Imagine what Louis Clin would say if he could see our party gathered around the corner table. My estimate is that picking would have been contemporaneous with the Battle of Stalingrad and the wine bottled as preparations were being made for the D-Day landings. Could Clin have predicted that 75 years later, a bottle would be opened not far from its place of birth? The magical properties of the time-buckling 1942 Richebourg Vigne Originelle Française Non Reconstitutée defy the laws of mature Pinot Noir. Over the course of 90 minutes, the wine gains substance from the ether. Like twisting a camera lens into focus, it turns from old Pinot Noir into Richebourg. It is not the most powerful Richebourg that has crossed my palate, nor the best. However, it is unquestionably the most memorable and most ethereal. It provokes something deeply moving, an elegy to vines extinguished by a louse and to lives cut down by war in that year. It is difficult to describe. There are vestiges of briary, damp forest floor and traces of dried blood on the nose, exquisite definition and freshness, but no attempt at concealing age. The palate is initially frail but undergoes a Damascene resurrection in the glass, finally delivering the arching structure that defines this wine as Richebourg. But there is something else. I cannot put my finger on it, but it is something that many pre-phylloxera bottles have in common. Something haunts the wine that is beyond words. The experience hovered in the forefront of my mind for hours afterward. And even months later, I still feel humbled and exceptionally fortunate that thanks to the generosity of a friend, I was able to imbibe history. As we depart the restaurant, Aubert de Villaine mentions that no bottles remain at the domaine. I know the location of one other genuine bottle in East Asia, thankfully in the possession of an appreciative and knowledgeable wine lover. Once that is gone, the 1942 Richebourg Vignes Originelle Française will live on as a dwindling handful of precious memories for those who encountered it, before becoming just a footnote in the history of the domaine. 95/Drink 2018.